You’ve seen the beach, you’ve dreamt of limestone islands, & you’ve foamed for Thai food since before you were born. Now you’re ready for the real deal, to witness this paradise with your own two eyes. 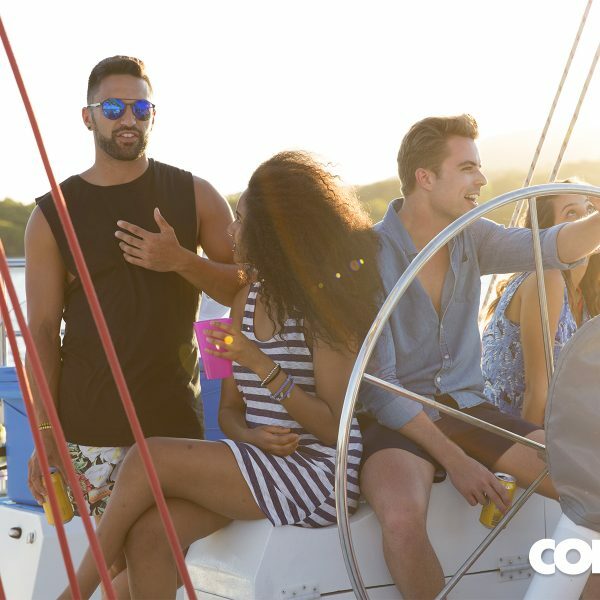 We’ll float you from Phuket to Koh Phi-Phi to Krabi, introducing you to nightlife and island vibes like nowhere else on earth. Was $869. Save upto $86. Well good morning explorers, it’s your first full day so time to get movin’ and shakin’. Spend the day dosing up on Vitamin D in a sea canoe, visiting famous limestone karsts and coastal caves, exploring James Bond island on our ME Time Optional, and alternating between cocktails and watersports (advisably not in that order). If you’d rather take to Phuket Town and admire the Chinese influenced local architecture. Swing high or lay low, the choice is entirely yours. The bright lights and wild antics of Bangla Road can take things up a notch this evening, even a famous cabaret show! Phuket It’s day three and ‘mai pen rai – don’t worry, be happy’ is now pretty much the group mentality. Enjoy a lazy breakfast and catch some rays before we hit the Andaman Sea in search of one very famous beach… – Included ferry ride to the island of Phi Phi Koh Phi Phi Arriving in Koh Phi Phi will leave you in a daze of love and happiness. More scenic than your wildest dreams, this island is home for the next few days. Glorious long salty days, balmy nights and endless ocean explorations are calling. 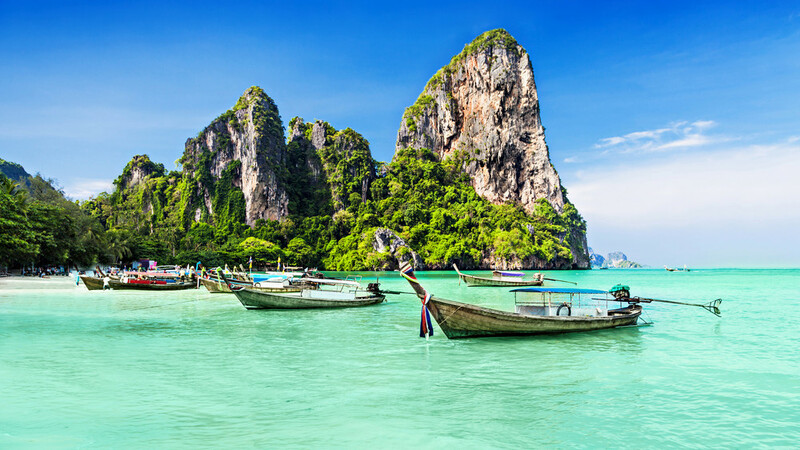 Dine on the herb-filled rice salad with grated coconut that is khao yam, watch the sunset from Koh Phi Phi’s highest vantage point, or stroll postcard beaches alongside playful monkeys. Definetely an evening you won’t be forgetting in a hurry. The island is your playground and the days are yours to do whatever your heart desires.Make time to visit THAT beach – it seriously won’t dissapoint. Grab a camera and strike a pose; Leo may finally have won his Oscar, but this is YOUR movie moment. 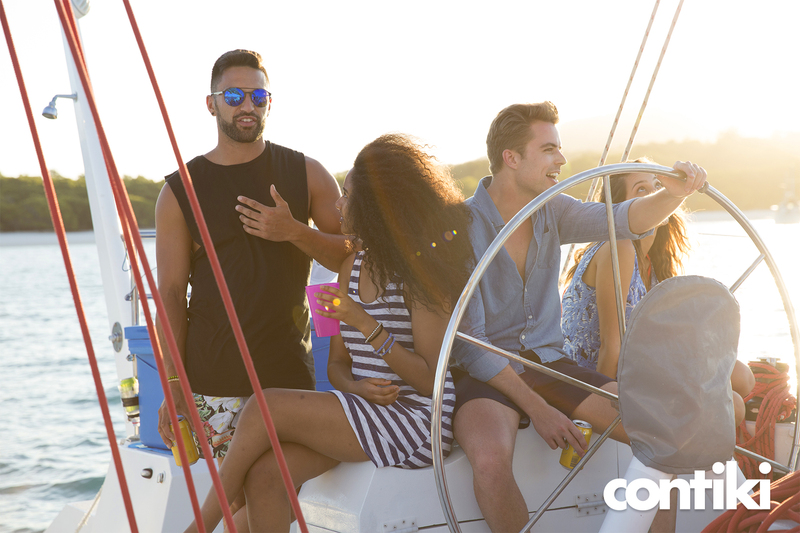 Do anything the alluring ocean has been distracting you from, or – what the heck – have another beach day, coconut in hand. Squeeze in one last beachside stroll with the flickering island lights as your backdrop, soaking up the island sounds and Pad Thai smells…this is what we call living. Although we’re leaving Kho Phi Phi and heading to mainland Thailand today, our salty seadog spirit won’t change a bit. 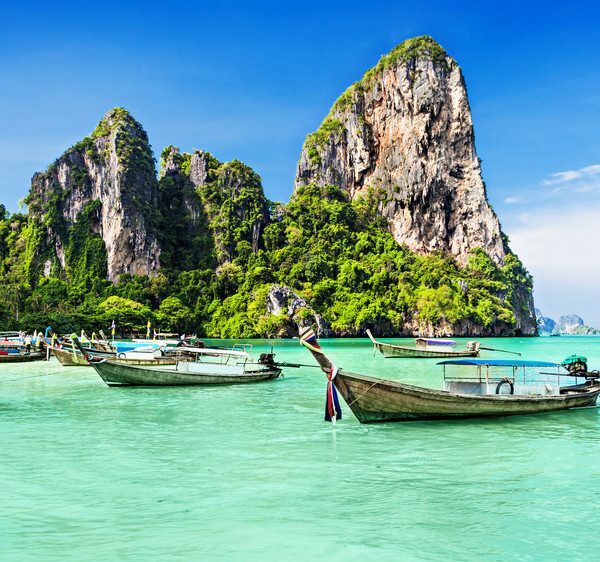 The exotic paradise of Krabi is calling our names, and who are we to resist… Krabi (Ao Nang) This afternoon we’ll soak in the small town feels of Ao Nang. Friendly locals, massage haunts, local markets and seaside cocktails can perfect your day like kaffir lime to a mojito. Krabi may look like the ultimate chill zone, but a wealth of adventure awaits those with itchy feet. March the 1260 steps to Tiger Cave temple (relax – it’s no longer filled with tigers) and marvel at the beauty of Buddhism, or shop up a storm of traditional Thai trinkets. It’s our last night together as a Contiki collective; best organise a team dinner and have one last evening of mischief. It’s our last night together as a Contiki collective; best organise a team dinner and have one last evening of mischief. After one final morning in paradise we’ll drive back to Phuket where our paradise adventure comes to an end. Have one final love in with your travel fam, then take our transfer either to the airport or back to our start hotel.